In its impact on the election, the debate was probably a draw. The Great Debate was, as all America except CNN knows, an anti-climax. No commentator's view is worth more than the opinion of anyone else who listened to the debate, but I think it was a tactical marginal victory for Clinton, a draw in its impact on the election, and a strategic victory for Trump. Neither candidate was impressive, and for those steeped in the debates of Lincoln and Douglas, or the Compromise of 1850, or even for those who remember the Nixon–Kennedy debates, it was a clumsy forensic performance. Hillary Clinton was mechanical, and while exuding experience, was smug and unconvincing. Donald Trump was far too preoccupied with himself and addressed the questions in the over-simplified and self-centered way that his followers often appreciate, but most consider immodest and shallow. Mrs. Clinton stayed on message better and gave marginally more relevant and persuasive answers and hence emerges as a tactical victor by a narrow margin. On the other hand, if Mrs. Clinton achieved her bare objective, Mr. Trump achieved his by not appearing the goon or ignoramus he has been portrayed as by most of the media and his opponents in both parties. Nothing he said will rattle around like some of his foolish remarks earlier in the campaign. Despite the absurdly fierce efforts of Mrs. Clinton and CNN to pretend that the birther issue (which was always an asinine red herring Trump should never have touched) was a racist attack on Barack Obama, Mr. Trump said nothing to fuel his stigmatization as a menace to world peace and sanity in government. He was also generally moderate and not over-assertive in what he said, and the temperament issue, on which, as he remarked, the Clinton campaign has spent $200 million, was a bust. Nothing from this debate will be remembered next week, although the moderator was obviously pro-Clinton and the house was packed with Clinton supporters. So, in its consequences, the debate was about a draw. My view that it was a strategic victory for Trump is based on the facts that he did not lose badly or say anything intemperate or damaging, and on the unmasking of the fraud of Mrs. Clinton's unconquerable superiority on the issues, as well as on his retention in reserve of his most destructive allegations against her. These include in particular the Benghazi debacle, the apology to the world's Muslims, and the Clinton Foundation quagmire. The Clinton campaign shot its bolt with a moderator who even the rabidly anti-Trump CNN acknowledged was obviously pro-Clinton. He mistakenly backed up Clinton's assertion that stop-and-frisk, the practice of police checking passers-by for concealed weapons, which is credited with reducing the urban crime rate but is unpopular with liberals on civil rights grounds, was definitively judged to be unconstitutional. He also seemed to support (mistakenly) her assertion that Trump, like her, had favored the Iraq War. This is fodder for the next round, when there may not be such a biased session chairman or such a Clinton hallelujah chorus of an audience. I believe that my opinion published here in July, that Donald Trump had conducted an "unpresidentially" flamboyant campaign to round up the Archie Bunker vote, and that he would henceforth be much less controversial as he tried to convince enough of the moderate majority that he is a reasonable and unfrightening man who deserves a chance to end the cycle of misgovernment that has afflicted the country for 20 years, has been proved accurate. Having filled out his ranks with the tens of millions of people whom Mrs. Clinton infamously described as "deplorables," most of whom are unexceptionable, law-abiding, tax-paying citizens, admittedly seasoned with a significant number of men who wear battle fatigues at home, own firearms, drink a lot of beer, and like going to shooting ranges and paint-ball parks on the week-ends, Mr. Trump has gained steadily in the polls and was effectively even with Mrs. Clinton going into Monday night's debate. There isn't reliable post-debate polling available as I write this, and I suspect that polling models under-represent the millions of former non-voters whom Donald Trump attracted into the primary selection process anyway. In similar fashion, I suspect that Mr. Trump used the first debate to test the waters and de-demonize himself, even if his excessive recourse to the perpendicular pronoun would have reminded many viewers of self-preoccupied youthful sports stars like the young John McEnroe or the Williams sisters, graduates of the Leo Durocher school of anti-nice guys. I suspect that we have seen all Mrs. Clinton has to show but that, in the next debate, Donald Trump will surprise her with a much steadier attack on her most vulnerable points, and a generally more fluent performance himself. We can't have everything, but one wonders what elegant speakers and debaters who sought this office in living memory would have thought of it. Franklin D. Roosevelt once got the better of H. L. Mencken at a White House Correspondents' Dinner; Ronald Reagan hammered Bobby Kennedy in a debate over the Genovese affair, and John F. Kennedy and Richard Nixon, and even Bill Clinton, were always pretty nimble. The flight from literacy is not the least of the country's worries, but these candidates have more urgent issues to discuss, and neither is in any position to affect a superiority over the other. As has often been remarked, neither would be imaginable as president if it were not for the identity and credentials of the opponent. In this sense, both candidates short-changed themselves by not being more effective, but Donald Trump has more room to grow. Hillary Clinton was as we have known her these 25 years. The Clinton campaign is asking for a fifth term for the Clinton-Obama fusion (two scorpions in the same bottle, pretending for transient reasons to be amicable), and an eighth term for the Bush-Clinton-Obama co-regency. It is a sign of its intellectual impoverishment that Hillary was unable to produce any new ideas. Her claim to extensive experience was well rebuffed by Trump's reply that it was "bad experience," the experience of failure. This exchange passed by without much notice, but it is a very dangerous impeachment of the entire Clinton campaign. Why does she want to be president, except because the office is there, the Mount Everest of American politics? Once again, the Republican nominee left viewers in no doubt that he would shake up government and do a lot of things differently. Despite verbal awkwardness, Trump stands for change and Clinton for continuity where two-thirds of Americans think the country is "going in the wrong direction." Mrs. Clinton is an adequate advocate of her cause, and Donald Trump is far from the ideal personification of change. But at least he represents probably the greatest possibility of change an American election has ever portended, except for Roosevelt's replacement of Hoover in 1933. George H. W. Bush's statement last week that he would vote for the return of the Clintons to the White House, they who got to the White House the first time only because of his mismanagement of the Republican Party, allowing the lunatic billionaire Ross Perot to fragment the vote, was a sad, sour end to his distinguished career. It was also, in its way, a confession of the bankruptcy of the whole post-Reagan era. If he wins, Donald Trump will have a mandate for radical changes to the tax system, health care, and law enforcement, and to end the appeasement of Iran, as well as to close up the southern border and renegotiate several trade deals. He might even slightly replicate General Andrew Jackson's dismissal of the whole top of the federal civil service (the "spoils system") in 1829, and his revocation of the charter of the Bank of the United States (a not overly positive precedent). 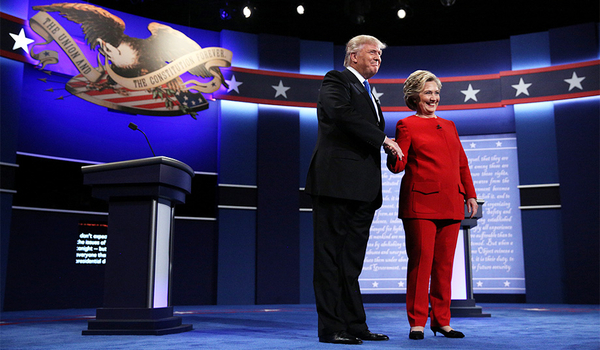 Donald Trump should get better; Hillary Clinton is unlikely to be any more impressive in the next six weeks than she was on Monday night.